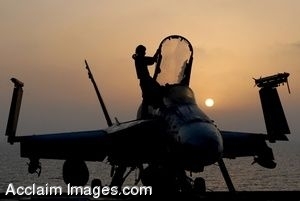 Description: Clip art photograph of Plane captain Aviation Machinist's Mate 3rd Class Kyle Alhers performs morning maintenance on an F/A-18C Hornet aboard the Nimitz-class aircraft carrier USS Ronald Reagan (CVN 76). Alhers, assigned to the "Fist of the Fleet" of Strike Fighter Squadron (VFA) 25, begins the maintenance routine before sunrise and often works late into the night. U.S. Navy photo by Mass Communication Specialist 3rd Class Gary Prill. Clipart photograph by Department of Defense Public Domain.